Sawyer Residence, Chicago, Illinois. Vladimir Radutny Architects. “Being tasked with converting this 100-year-old dilapidated Chicago two-flat into a single family home gave us an opportunity to respond to a question: How does one preserve and integrate the intangible building qualities of yesterday and today while breathing new life into an existing derelict shell? Our approach to the question entailed observing the existing “heaviness” of both material and space, considering the juxtaposition of restraint and ornamental excess, exploring qualities of openness alongside compartmentalization, and superimposing old craft with new traditions. Furthermore, our interest in “phenomenal transparency” as a space-organizing strategy was tested here both in section and plan. Newly-introduced walnut millwork elements were programmed as stairs, walls, and storage; these elements physically and visually cut through space, connecting rooms and their adjacent zones. 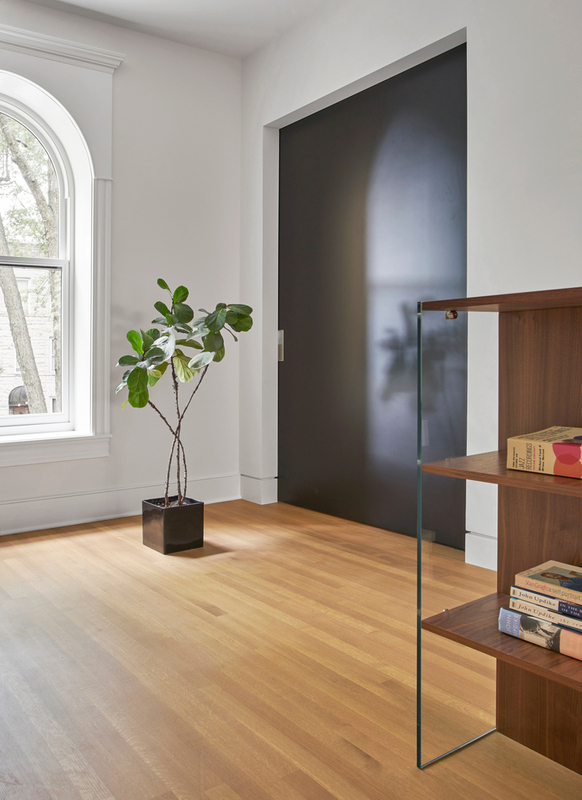 Salvaged old doors, hardware, and trim were seamlessly integrated with the new architectural language, keeping the design composition cohesive, and merging past and present together as one articulated thought. The result is a home that is light, connected, and fully functional for a growing family. The project thus introduces new spatial meaning into an early 20th-century building, melding qualities from the past with a design logic and lifestyle for today. The exterior of this single family is thought of as an arrangement of continuous landscaped zones offering seasonal beauty for the homeowner, the neighbors, and an occasional passerby. The front, side, and rear yards are all stitched together using a similar material palette of crushed bluestone gravel, large pavers, and indigenous plants. Varying in both color and aromas throughout the growing seasons, an urban landscape that is wild, yet beautiful is visible from the windows of both the home and the surrounding buildings. The principal element of this landscape project is the backyard, where the new sculpted deck transforms it into a place for gathering, refuge, and play. Composed of cascading cedar platforms, the homes main living floor extends and gradually descends to grade. Each step widens and turns, letting the imagination run wild with its myriad functions.